A car with a famous Italian name, a 4 cam V8 - capable of moving the car to over 150 MPH - a luxurious interior, 4 doors and can be purchased for around $10K sounds too good to be true, right? Well, it is and isn't. The Maserati Quattroporte is that car, but $10,000.00 is just the entry fee. 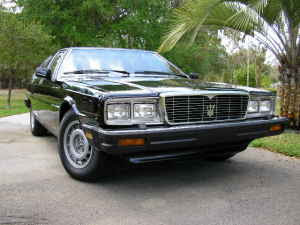 The Maserati Quattroporte was designed to compete with the BMW and Mercedes sedans of the day. In performance and luxury it competed well with the German brands. In terms of reliability and maintenance costs, that's another story. The Quattroporte is not necessarily an unreliable car, but in order to keep it running properly maintenance is an absolute must. If it does break down be prepared to pay big money for parts and repair. An engine rebuild can cost you the price of this car. Back in the late eighties I talked my way into a test drive of a used Quattroporte. I remember it being ungodly fast, but incredibly poised for its size. I also remember my girlfriend at the time being scared sh*tless during the test drive and saying that if I bought the car she'd leave me. In retrospect I should have bought the car. Of all the cars I've posted on this blog, a Maserati is the one I'd most recommend you have a mechanic (one who is very familiar with Maseratis) check out thoroughly before you buy it. A good Maserati Quattroporte can be a lot of fun and relatively trouble free, but a bad one can easily bankrupt you. One other quick note: While Maserati is back selling cars in the US, most of the current Maserati dealers want nothing to do with this car or any other older Maserati. Most parts will have to be purchased from specialty companies. The Quattroporte is a true exotic Italian car that you can get into for very little money. But, remember, the price of the car is just the beginning. Budget plenty of money for maintenance. This Quattroporte, listed on Craigslist, appears to be in immaculate condition and owned by a collector. Located in Tampa, FL, click here to see the listing. If you're a fan of Maseratis, or curious about them, check out Enrico's Maserati Pages. It's an enthusiast maintained site with over 700 pages! It's an amazing site. I've owned a 1986 version for about 10 years. I tracked it at Sonoma's Infineon raceway when the new Quattroportes were released even. Great big sedan with lots of power and great driving car for its weight. Be warned though with a heavy foot you'll see 6 mpg and that big tank requires some deep pockets to fill regularly. The seats are heavenly and its a great old solid car. Very rare and as such hard to find. The V8 dates back into the 50s racing era and is in my experience bullet proof with a huge oil reserve. I think of it as an Armani suit in steel. Every time I think about selling it I change my mind with one drive.